GEER Foundation Recruitment for Laboratory Assistant 2018. This blog is available on a daily basis in primary school circular, educational news, breaking news, all goverments and private jobs, new techno tips, insurance, loans, new mobile tips and all competitive exams, most certified model paper, old paper, IMP literature and most of the GPSC Exam Content ... like TET, TAT, HTAT, Police Constable Recruitment, GSSSB Clark, Talati and other exams. Visit Gkexam every day for the latest offers of various brands and other technology updates. 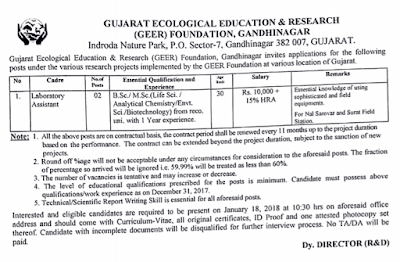 Gujarat Ecological Education & Research(GEER) Foundation Recruitment for Laboratory Assistant 2018. Educational Qualification: B.Sc. / M.Sc. (Life Sci. / Analytical Chemistry / Envt. Sci. / Biotechnology) from reco. uni. with 1 Year experience. How to Apply : Interested and eligible candidates are required to be present on aforesaid office address and should come with Curriculum-Vitae, all original certificates, ID Proof and one attested photocopy set thereof. Candidate with incomplete documents will be disqualified for further interview process. Venue: GEER Foundation, Indroda Natural Park, Sector – 07, Gandhinagar 382007.